You can easily add your own subjects with the Cut Out tool in StudioMagic I, or redesign them to make your own signature virtual sets, stages, billboards and marquees to place your friends, subjects, or clients on. The layered TIFF files, combined with the detailed video tutorials to guide you step-by-step make this started collection an absolute must have. 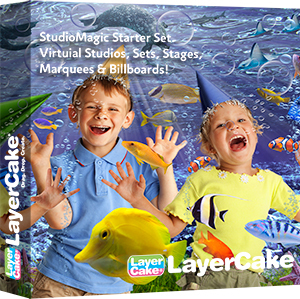 In other words, the Virtual Studios, Sets, Stages, Billboards & Marquees set is for… EVERYONE! Easy enough for amateurs to use; they are a workflow time saver for pros; Photoshop users as well as users of other editing applications such as OnOne, Luminar; or, Affinity Photo; professional graphic artists and designers; and anyone who simply enjoys letting their creative juices overflow to create wondrously new imagery. Tags: Adobe, amateurs, Creatives, Digital Backdrops, digital backgrounds, Digital Compositing, fashion, Graphic Design, Graphic Designers, high-resolution, how to photoshop, magination, multiple layers, Photography, Photoshop, Photoshop Users, scifi, Software, sports, StudioMagic, Virtual Sets, whimsical.